Before we do anything let’s crank up those Christmas Carols and get happy! I have Diana Krall Christmas Songs on the iPod/Sonos to sing along to, with the occasional dance around the kitchen with the kids! It’s feeling very festive over here. This is day 1 of advent – which means only a few weeks to plan and play ready for my favorite holiday. I ordered pretty round preserving jars at Weck – I was looking for a round jar with clear sides that I could use to bake cake in. The recipe is quick and easy to make up – based on a Delia Smith recipe and then adapted it for America and my taste. Currants, raisins, saltanas – oh my! 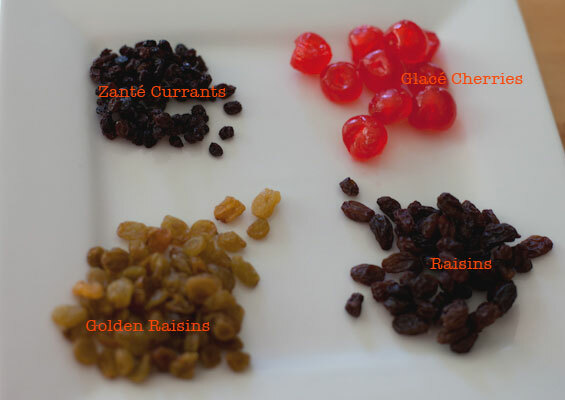 I’ve barely learned to distinguish my raisins from my currants and my saltanas from my golden raisins. You start the night before you want to bake the cakes to let the dried fruit plump up with the cognac. Once the mixture is complete, take a moment to gather the family so everyone can take a turn stirring the mixture to make a wish. 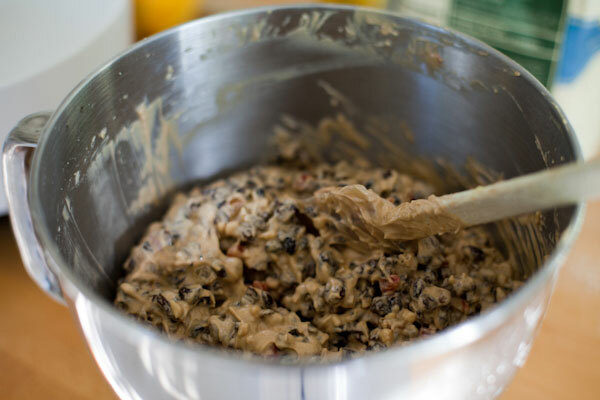 Traditionally this should be done on the last sunday before advent – Stir-up Sunday was when everyone would make their Christmas puddings and cakes in England – okay so I’m a little behind. Remember to get extra Rémy Martin cognac for all that sugar and spice and all things Christmassy. Feeding hungry cakes before decorating them plus a night cap or two. I do love this rich, smooth nectar of French royalty and it’s going to infuse the cakes with that je ne sais quoi… that’s if there’s any left after my tipple! 1/2 teaspoon ground all spice. 1. 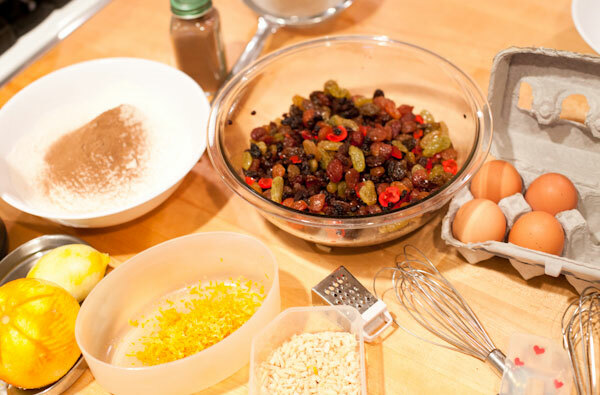 The night before you wish to bake the cake you need to put all the dried fruit in a large bowl and mix in the cognac. Cover the bowl with plastic wrap and leave overnight for the fruit to absorb the alcohol. 2. 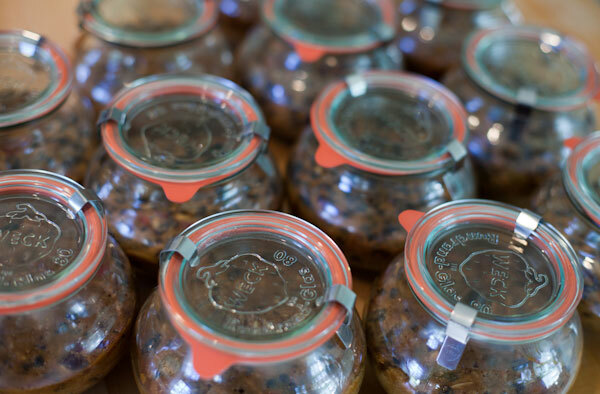 Sterilize the Weck jars by placing them in a large pot of boiling water for 10 minutes. Dry and place on a large sheet pan. 3. Preheat the oven to 275 degrees F.
4. In the bowl of an electric stand mixer with the whisk attachment cream together the butter and sugar until light, pale and fluffy, about 5 minutes. 6. Gentle fold in the flour, nutmeg, and all spice trying to maintain as much air in the mixture as possible. 7. Add the soaked fruits to the cake mixture, along with the almonds, the orange and lemon zest and the molasses. Fold these in carefully, using the same gentle technique as before. 8. Using a teaspoon put the mixture into the prepared jars being careful not to get any on the sides and mouth. Smooth the top out with the back of the spoon and wipe away any cake batter from the sides. 9. Cover each jar with a circle of parchment paper with a small hole cut in the center. Bake in the oven towards the bottom for about 1 1/2 hours (the small jars will take less time to cook than the half liter jars). The cake is done when the center springs back to the gentle pressing by a finger. Remove from the oven and cool complete on a wire rack. 10. Feed the cakes with drops of cognac at least twice between baking and frosting the cakes. 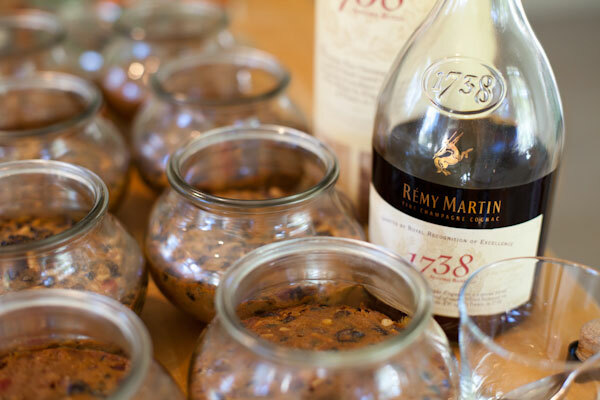 Make several holes in the top of the cakes with a fine skewer or toothpick and then drop in some of the Rémy Martin. The rubber seals and lids can be used to store the cake in an airtime environment between feeds. 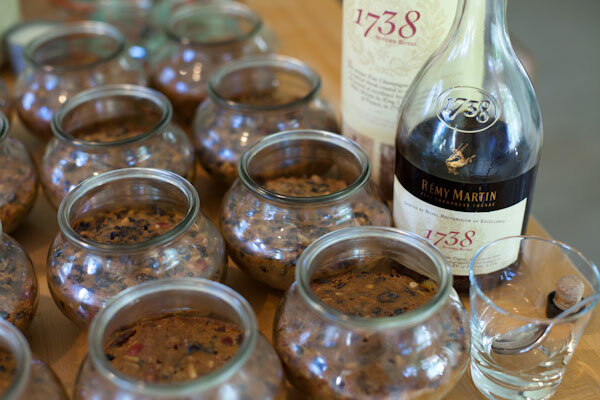 Having baked up the christmas cakes in a jar and then fed them with Rémy Martin cognac for a few days here’s how to turn them into showstopping christmas gifts. Boil up a couple of tablespoons of apricot jam with a tablespoon of cognac to make a glaze. Set aside to cool. Dust the work surface and rolling pin with confectioners sugar and roll out the marzipan to just under 1/4 of an inch. Using the lid of the Weck jar as a template cut a circle of marzipan a little larger in diameter than the lid. 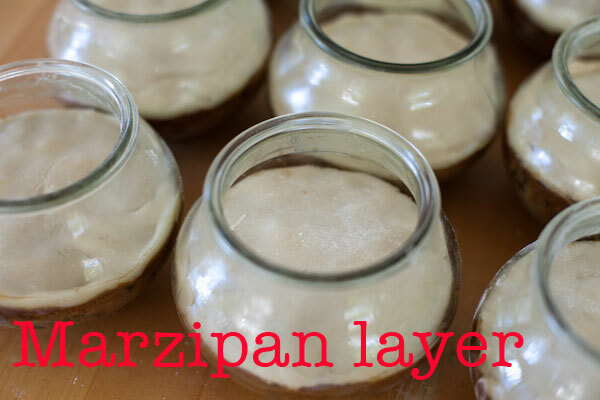 Brush a thin layer of the apricot glaze on the top of the cake in the jar and then ease the marzipan circle into the jar and gently push into place so it touches the sides. 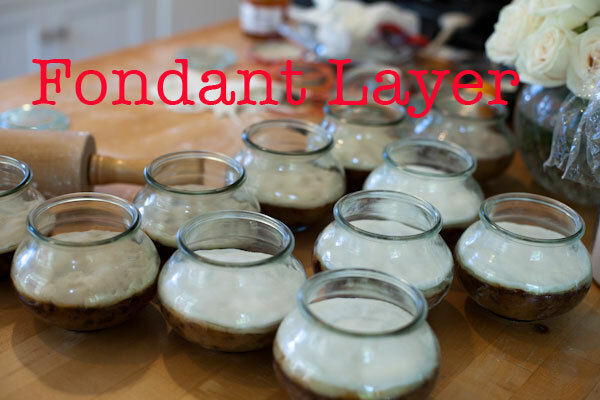 Roll out the white fondant to 1/4 inch and cut out a circle using the lid of the jar and making it a little larger. Brush another thin layer of the apricot glaze on to the marzipan and then ease the fondant into place, smoothing it out and pushing it to the sides. Clean the sides, inside and out of the jar using a damp piece of kitchen paper. Make a little snowman out of two small balls of fondant. 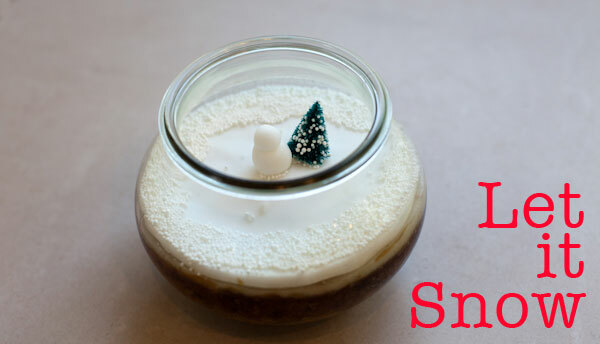 Dip the christmas tree into water and then into the white sprinkles and let dry. Arrange the snowman and the tree in middle of the snowscape and add lots of white sprinkles for the snow. Then it was time to package them all up and post them to England for the family – hope they get there in time… as for tips on how to eat these? Remove the tree (NOT EDIBLE) and then dig in with a spoon! Let the holly jollys begin! oh my goodness!! I love these!! 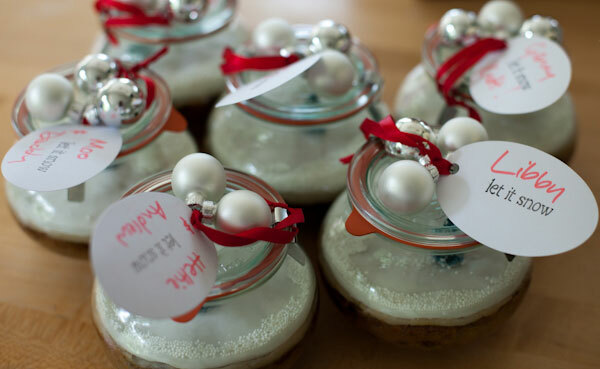 It’s amazing what you can bake in jars now! I love weck jars . . so pretty!! 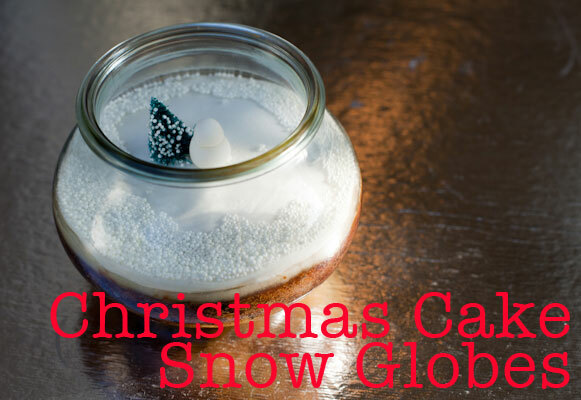 love these christmas cake snow globes. . so festive and pretty!!! I’m experimenting with ginger cake too as I now lots of people don’t like fruit cake! Oh Lucy, these are STUNNING! Really creative. LOVE these! I think fruitcake gets a bad name because people haven’t actually eaten GOOD fruitcake. These are so adorable! I think the key is lots of cognac! So So Cute!!!! You are so creative!